Last night I was lucky enough to attend The London Edge celebration party, hosted by Collectif. 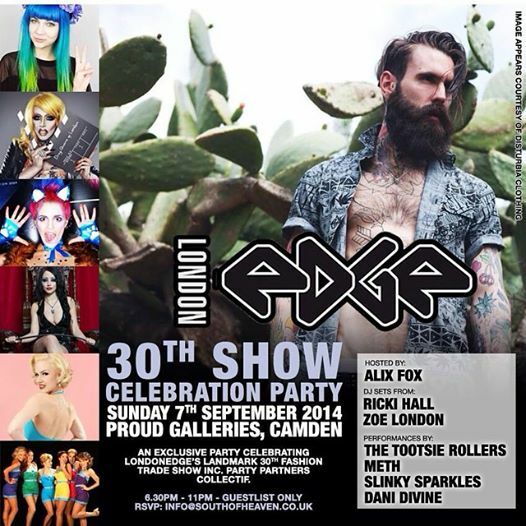 It was a party for everyone working at London Edge (a massive tradeshow for the alternative fashion world), and Collectif had also sold 100 tickets for £10. If you managed to snag a £10 ticket you got a Collectif dress which you wore on the night. Was a brilliant marketing idea - the venue was full of new season Collectif! If you read my blog you may know that I've been lucky enough to have partnered with Collectif for years now, which means I've had the chance to watch them grow into the superstar fashion brand that they are now! 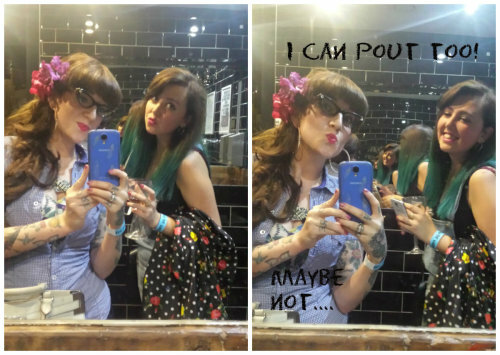 I wore a smidge of Collectif, poking out under my shirt, as a nudge to them without being too obvious! The night contained a burlesque performance from Slinky Sparkles (who I actually worked with years ago when I was a cabaret stage manager/hand), and a drag queen called Meth. We had two DJs, Ricki Hall (@rickifuckinhall) and Zoe London. It was lovely to catch up with Zoe London, I actually collaborated with her, back in day, and we launched a shade of Rockalily Lipstick in her name (ZOMG!) and look how young we look! It was fun to bump into quite a few of our Rockalily clients at the party too! Now, I'm surprisingly shy when it comes to approaching people, but last night I made an exception. Over Four years ago I blogged about Kandy K, and when I saw her standing at the bar near me, I knew I'd regret not saying hello. I never know what to say, so rambled on about being a fan for a very long time. She was of course as lovely as I'd always presumed! Just a few moments after feeling all awkward and silly talking to Kandy, a super gorgeous lady came and asked me for a photo with me (!). How humbling, and perfect timing. The Tootsie Rollers performed too - what a night! Remember if you're treating yourself to a Collectif purchase, use REE10 for a little discount. Oh, also turns out that the world is divided into two groups - those who pronounce it Collect-IF, and those that say Collect-EEF.